"After receiving a report of whales on the west side of San Juan Island in the early morning, Center staff cast off from Snug Harbor in vessel Orca at 8:15 a.m. and found members of J,K, and L pods heading north in Haro Strait off Limekiln lighthouse at 8:25 a.m., spread out in singles and groups. The main mission of the day was to find L90 and monitor her health and behavior, so we moved from group to group trying to locate her. 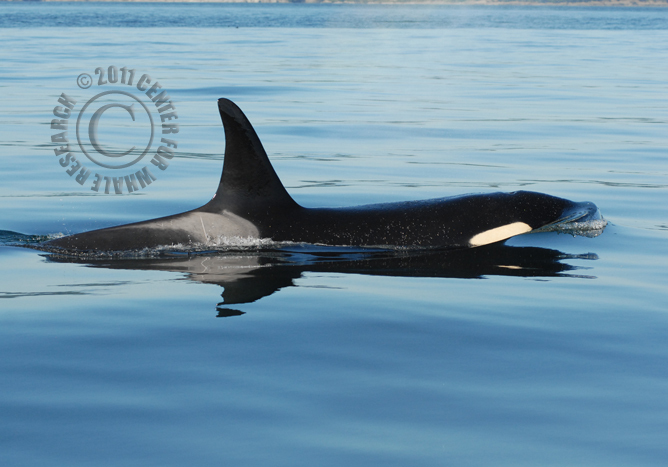 Around 9:15 a.m., we found L90’s main traveling companions, L26 and L92, in the proximity of J pod members near Kelp Reef, moving rapidly north in Haro Strait. About a half-mile to the southeast of this group at 9:33 a.m., we found L90 traveling north by herself at slow to medium speed. She was trailing the other whales by as much as 3/4 mile and never less than 200 yards. We collected respiration data on L90 for two periods from 9:40-10:46 a.m. and 1243-1342 a.m., during which times she was breathing regularly at intervals averaging 33.6 seconds and 29.9 seconds, respectively. Meanwhile, the rest of the whales traveled north in Haro Strait, and then northeast into Boundary Pass. During these two data recording periods, L90 only made one “long” dive of 180 seconds which was immediately followed by her shortest recorded dive of 8 seconds. Her swimming speed was 4.4 and 4.6 knots, respectively, during the data recording periods. When sea conditions and proximity allowed proper observations, it was apparent that L90 was not diving deeply and her surfacing motion seemed stiff – often with more of her back behind the dorsal fin exposed than a healthy whale would have exposed on a normal surfacing. However, she showed no visible signs of emaciation and did not have foul smelling breath, two common indicators of illness. Based on our observations it is clear that her behavior is abnormal, however the cause remains unknown. Around 2:15 p.m., as the leading whales picked up speed near East Point, L90 also increased speed and caught up to the other whales just north of East Point. She joined with L26 and L92, and the three traveled rapidly (>7 knots) NNW toward Point Roberts amidst other loosely spread, rapidly moving, mixed groups of southern residents. We ended the encounter at 2:51 p.m. approximately 3 miles north of East Point." L90 was again encountered the following day, September 4th, and appeared to exhibit the same behavior. We will be taking every opportunity to continue to observe L90's condition and will provide subsequent reports. I have been looking forward to any news on L90's condition, and check the blog daily. Thank you so much for the update, and thank you for your dedication to the whales! Maybe she slipped a disk in her back...Too bad they don't make whale chiropractors. Is L-90 ok now? Is she pregnant?